People drink alcohol for a variety of reasons—to celebrate, relax, and socialize with others. 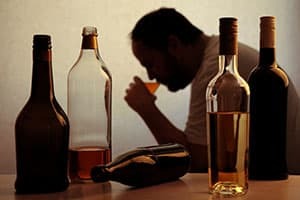 For most people, moderate alcohol use is not a problem, however some people experience harm and distress related to their drinking.2 In the United States, approximately 18 million adults have an alcohol use disorder (AUD), which is characterized by compulsive use, loss of control over that use, and significant negative emotions when they can’t drink. Intense craving or desire to drink. Trying to stop drinking but being unable to do so. Giving up enjoyable activities to drink. Spending a considerable amount of your time drinking or getting drunk. The effects of drinking interfere with your ability to work, take care of your family, or fulfill other responsibilities. Continuing to drink despite these negative consequences. Tolerance (needing more alcohol to get the same effect). Withdrawal symptoms, such as insomnia, nausea, sweating, irritability, anxiety, fever, hallucinations, and seizures after trying to stop drinking. If you are not sure if your experience with drinking is problematic, it is best to consult with a medical or addiction professional who can determine if you have an AUD. Though rare, hepatic toxicity can develop even after you’ve used the drug for many months. If you suspect you may be experiencing any of these severe signs of hepatic impairment, report it to your doctor right away.5 Cases of Antabuse poisoning have also occurred when the medication is not taken as prescribed, which is seen most often in children and usually occurs as the result of incorrectly or negligently storing the medicine. U.S. National Library of Medicine. (2012). DailyMed: Antabuse. National Institute on Drug Abuse. (2018). Alcohol. American Psychiatric Association. (2013). Diagnostic and Statistical Manual of Mental Disorders, Fifth Edition. Washington, D.C.
De Sousa, A. (2010). The Pharmacotherapy of Alcohol Dependence: A State of the Art Review. Mens Sana Monographs, 8(1), 69­–82. Center for Substance Abuse Treatment. (2009). Incorporating Alcohol Pharmacotherapies Into Medical Practice. Treatment Improvement Protocol (TIP) Series, No. 49. Rockville, MD. Skinner, M.D., Lahmek, P., Pham, H., Aubin, H.J. (2014). Disulfiram Efficacy in the Treatment of Alcohol Dependence: A Meta-Analysis. PLOS ONE, 9(2).